The Hillbilly Days Run for the Kids 2019 10k Run/5k Run/2 Mile Walk will be held Saturday April 13, 2019, in Pikeville, Kentucky. 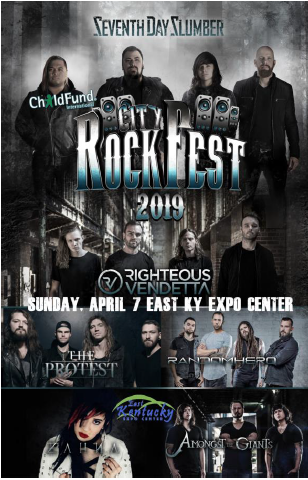 City RockFest, featuring Seventh Day Slumber, Righteous Vendetta, The Protest, Random Hero, Zahna and Amongst the Giants will be performing at the Eastern Kentucky Expo Center Sunday, April 7, 2019. Tickets on sale Friday, November 20, 2018 at 10 am. You can visit the Appalachian Wireless Box Office, Ticketmaster.com, or charge by phone at 1-800-745-3000. Tickets start at $13.00. Day of show $18.00.